Out to sink the "Good Ship Army," the Pasco Navy Flyers set sail for Seattle this week to turn the trick in Sick's Stadium where the July Fourth Baseball Classic will be staged to determine the service championship of the Northwest. 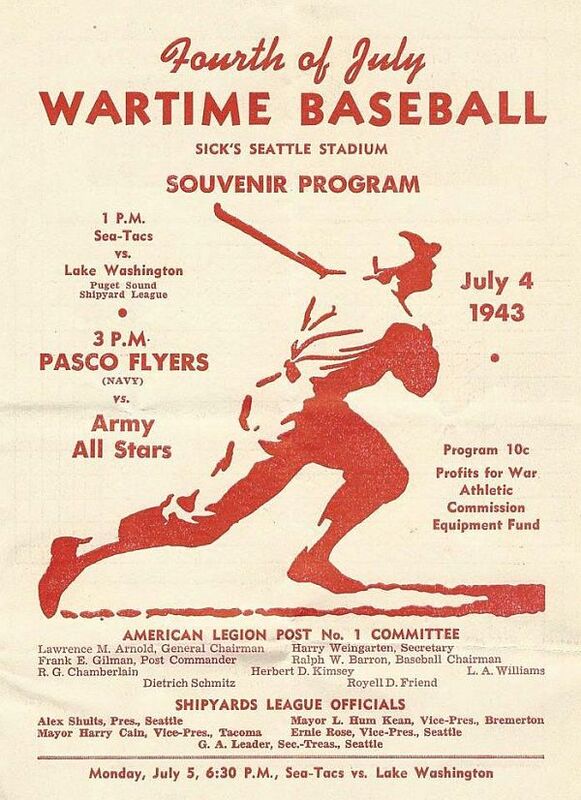 Proceeds of the game, which is staged under the auspices of the American Legion, will go to sailor and soldier athletic and recreational equipment to be distributed by the Seattle War Athletic Council. Another game slated in the gala holiday bill, is the Sea-Tacs-Lake Washington Shipyarders preliminary scrap. 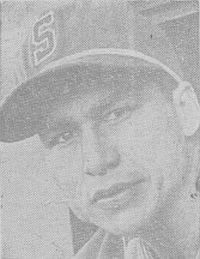 The Flyers, at their peak, with impressive victories over the San Diego Padres, Fort Lewis, Fort Lawton and many other service teams will probably have Johnny Bittner on the mound to face the Army All-Stars' ace Bob Hendrikson. Hendrikson, former big league and WIL pitcher, hurled his Fort Lawton mates to a 6-3 verdict over the sailors earlier in the season. With Secretary of the Navy Frank Knox, Gov. Arthur Langlie and leading Naval and Military leaders rooting for their service favorites, the game promises to draw baseball fans from all over the Northwest. Coach Ken Peters will be taking a twenty-man squad to the Queen City for the game to meet the Army team which has re­cruited their players from Fort Lewis, Fort Lawton, Paine Field, Ack Acks and the Barrage Bal­loon Corps. Leading off the Flyer list are Edo Vanni, Levi McCormack, Danny Escobar, Don White, Danny Amaral, Bob Kahle, Marty Martinez, Steve Ananicz, Mel Cole, Harvey Storey, Lindsay Brown, Bill Scoppettone and Bob Hornig. Relief pitchers on deck ready for action will be Hunk Anderson, Mike Budnick, Rube Sandstrom, Fred Gay and Edson Bahr. Coaching the Army entry are Lieut. George "Jiggs" Dahlberg and Private Morrie Arnovich, for­mer New York Giant outfielder, who'll have a great aggregation of stars on hand, including Clar­ence Maddern, ex-WIL slugger, Earl Torgeson and Herm Reich, Jim Robinson, Roy Paton, Andy Anderson and Bill Beard. Enlisted men will be admitted free to the games. Prices for re­served box beats are $1.25 while the grandstand seats go on the chopping block at $1.00. There'll be music for the base­ball fans too. Both the Navy and Army Bands will be there to pro­vide maritial [sic] airs. Here's Jack's coverage of the game which the Pasco Flyers won 3-1.